The innovative IDEAL Premiere band saw blade is the most versatile Bi-metal blade available on the market. It is an all-purpose high-quality blade, well-suited for varied sawing operations including the cutting of tubes and structural shapes in layers and bundles. This blade is perfect for cutting a wide range of alloys, making it our customer's favorite for several years. 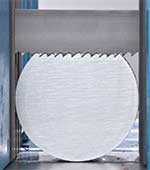 High performance band saw blade with positive rake angle and aggressive tooth geometries providing optimum angles for top cutting performance and a longer lifetime. It is specially designed for high-production cutting applications where cut accuracy and blade life are the most critical factors. The APEX RF is a favorite among mill owners and portable grinders such as "Wood-mizer", "SMG-Champion", "Norwood", "Sawmill Valley" and more. Swedish-made and made from the most efficient steel in the world, the Apex RF offers the best value for money and the best performance. Our IDEAL Proflex is a multipurpose carbon steel saw blade particularly suited for wood cutting and non-ferrous metal cutting. This is our most economical band saw. 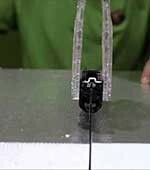 Sharp Blades are the best solution for cutting foam, synthetic foam, insulating materials, polyurethane, composites, plastics. etc. 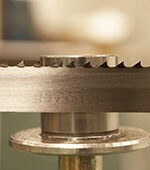 These blades slice into the materials leaving little or no residue and dust. 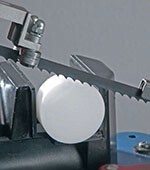 When cutting, the cutting blades do not generate any loss of material. The IDEAL Profil is a top performance bi-metal bandsaw blade, particularly wear-resistant, with high cutting accuracy, in a great variety of dimensions and tooth numbers. It is particularly suitable for vibration-reduced cutting of thin or medium materials and where where contour cutting is the norm. The IDEAL Carbide Set tooth/Foundry is great for cutting high temperature alloys. It has also been designed for production cutting operations, steel service centers, foundries, aerospace and forging houses. 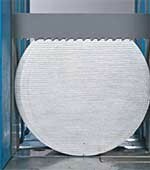 The Ideal Podium is a high-performance Bi-Metal bandsaw blade with a unique tooth geometry which prolongs blade life and minimizes work hardening. It is ideal for cutting exotic alloys and hard-to-saw materials and provides faster cutting. 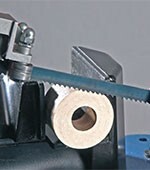 The Idéal Double-Tempe is a High-grade carbon hard back bandsaw blade. 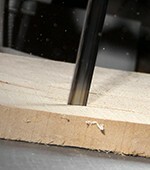 It has been optimized for faster and straigther cuts for wood and metal sawing and cutting operations. 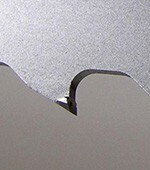 We offer a wide range of bi-métal , carbon , carbide , sharp blades. 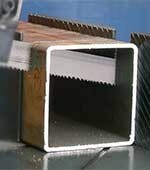 With IDEAL band saw blades, you will reduce your cutting and manufacturing costs considerably. 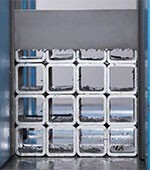 Each range has been tested to provide the best cost-per-cut performance. Our high quality blades will reduce sawing time, provide a perfect finish and improve your cost per cut ratio. IDEAL blades have a longer life and therefore require less replacement, reducing installation costs and saving the environment as well as energy. Finally get good quality without compromise! Montfort has the largest inventory of saw blades in all of Eastern Canada! Our consultants cover Canada to optimize your sawing operations. You will benefit from our VAP Value Added Program for our valued customers.